Speedy LSU hammered pokey Ohio State 38-24 to win the supposed NCAA football BCS National Championship. Was it the right two teams? Should a 2-loss team be in the game? Is the BigTen season ending the third week of November a factor? Or is just that speed kills? Once again, a faster opponent has shown a lumbering ox the door. Though he’s taken a lot of heat for a 1-11 season, and is criticized for his positive attitude and high goals (a typical Minnesota passive-aggressive response), Minnesota Gophers coach Tim Brewster has a plan. Speed. Speed. And more speed. He has lined up 6 Four-Star recruits and 11 Three-Stars. The theme is speed. Defensive backs with speed and size, mobile linebackers, and lightning fast receivers. The current stars of the class are: 6-4 QB MarQueis Gray, who lit up the Army High School All-Star game; David Pittman, a 5-11 195 lb QB who will likely play slot back; and (Big Play) Traye Simmons, a DB with 4.4 speed in the 40 yard dash. Add to that two four-star WR in Brandon Green and Vincent Hill. They have also recruited four-star linebacker Sam Maresh, who at 6-2 240 lb. runs a 4.7 40 yard dash and three-star DB Simoni Lawrence, who clocks in at 4.55. 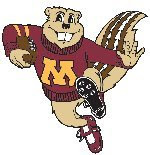 The dinosaurs are dead, and the Gophers are taking over. 10 years from now, will they be talking about how Tim Brewster remade the BigTen?